CASA DI PAN. Au coeur du village de Panicale, dans une position très calme avec une vue imprenable à seulement 2 minutes à pied de la place principale de Panicale. Une belle ferme du 18ème siècle récemment restaurée à un niveau très élevé. Plein de carachter et riche de détails: sols en terre cuite, des arches, des niches, des plafonds avec poutres apparentes, peintures, riche riche de renseignements et de détails. La petite ferme de 130 sq. M est développé sur 2 niveaux entourée d'une belle et unic jardin arboré avec 2 porche pour dîner al fresco + barbecue + piscine. Splendide vue tout autour. Faites-en un coin de rêve dans le village de Panicale. Rez de chaussée: grand salon avec table et chaises, canapé-lit, zone wifi. Cuisine équipée. 2 salles de bains (1 salle de bains complète avec douche). 2 porche extérieur pour le dîner al fresco équipé avec table et chaises. Premier étage: une petite cuisine (pour le moment du petit déjeuner), salon, 1 chambre double avec salle de bains avec douche, 1 chambre double avec 1 salle de bain complète. Splendide vue de toutes les fenêtres. Écrans partout. À distance de marche, à 2 minutes de CASA DI PAN: bars, restaurants, magasins, boulangerie, groeceries, Banque avec ATM, pharmacie. Bureau de poste. Maison bien équipée, confortable, dans un village des plus vivants et sympathique! Katia est dévouée, à notre écoute et tellement gentille. Panicale est bien situé pour visiter Orvieto, Perugia, Assise etc. L’Ombrie, une région à découvrir! 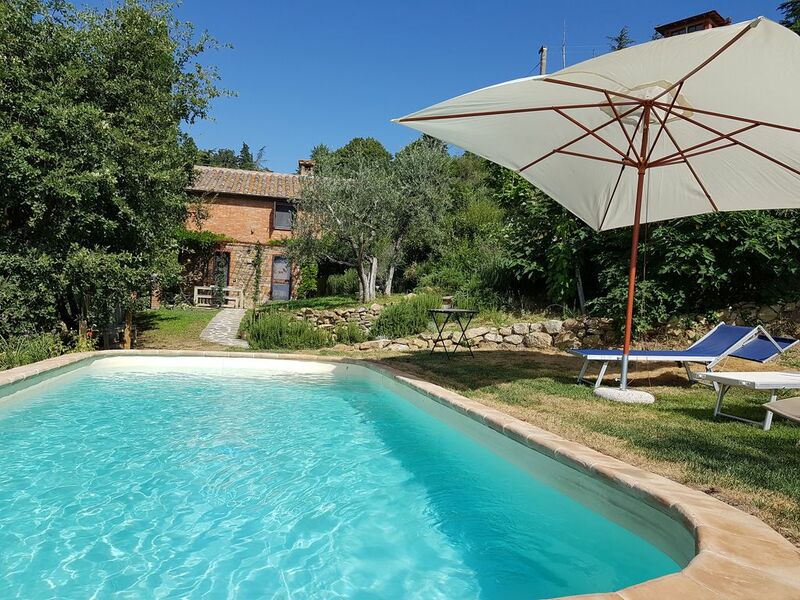 1 - being 100 metres from panicale - an amazing classic Italian village on top of a hill with amazing views. We would pop up each day (3 mins walk) for a coffee and ice cream with the kids, sitting in a stunning little piazza. In the evening we had great wine and meals in the lovely local bars and amazing restaurants. 2 - views. The views from the house and village are amazing. We had a great relaxed and proper Italian holiday in Panicale. It is a fantastic town and you will be looked after by Katia, her team and also the locals who were very helpful (wine to choose!) and what to do. We would highly recommend staying here. The house, gardens and pool were exquisite, more than we expected, simply superb. We had a wonderful time. Lounging around near the pool, chilling out in the pool, sipping a glass of the local wine, while looking out across the valley. The house is so close to the main Piazza Umberto I, just a few minutes away, where every Thursday there was a concert. The restaurants and cafes are brilliant, especially Aldo's, where we enjoyed many a coffee, wine, Aperol, cocktail and of course ice-cream. The little town has everything you need, a bakery just down from the post-office, a Conad mini-market which brims with all essentials, as well as local pottery, just across the alley is the butcher's who make a knock-out lasagne. You can buy your postcards in the main Piazza and there is a bank / ATM. The town is a slice of medieval Europe. It is beautiful, don't forget to go to the tourist information (again, in the main Piazza). They organise tours to the local museums housed in deconsecrated churchs (you must see Perugino's Martyrdom of San Sebastiano) as well as the little theatre of Cesare Caporali - spend a few extra Euros and your ticket will also include entrance to museums/sights in Citta dela Pieve, Paciano and Piegaro. Panicale is also an excellent base for visiting the region. We had a day trip to Rome (by train from Chiusi), Perugia, Assissi, Cortona, Castiglione del Lago, Montepulciano and many others. Our host, Katia, was so helpful and kind. Her family and all Panicalians were so welcoming. We have come away from Panicale feeling we have left behind many new-found friends. We were so impressed and for sure we will be back. We are even considering buying a place there, that is how much we fell in love with Panicale ! Our trip to Panicale was an abosolute delight - comfortable accomodation, lovely little village and beautiful countryside surroundings. The house was just perfect for us. It was well equipped, had plenty of room and the pool was amazing! Katia was wonderful and always on hand to help with anything if needed. Would definitely recommend and hope to visit again one day. Thank you! My family and I spent two much too short weeks in this beautiful house. One week we were accompanied by my parents. The porperty ist perfectly laid out for two parties. We enjoyed the wonderful garden and the stunning view into the valley. The center of this lovely "borgo" is just a view steps away. Panicale lays perfectly for daily trips to all important and well known landmarks in Umbria and its just a stone`s throw to Tuscany. We even made a trip to the coast near Ancona. But you do not have to go as far if you like to swim, the pool inside the garden is wonderful. And we did not expect it to be already open in May - but it was! Thanks to the very amiable property manager, who welcomed us with open arms. We had a perfect time in Umbria, thank you! We didn't know what to expect.. staying in a farmhouse for 6 weeks? Definitely a new experience. As soon as we arrived we got very exited about Panicale and met our landlord and the rental agent. Even more so when we got to Casa Di Pan..... what a pleasant property! Cute, charming and with all the things we needed. Comfortable beds and the living room is decked out as a rustic farm house with a huge dining table and comfortable sofas and chairs. Gas stove - fridge - it is all there. We have booked for 2019 and suspect we will be regular annual guests. We walked to the village several times a day and got to know the locals and many ex-pats there. First stop: Aldo's. For Cafe Canadese. I could go on for a long time, but this was an experience that way surpassed expectations. Oh, I should mention the serenity on the deck... the view is just amazing. An afternoon outside with an adult beverage is just plain old therapy. Thanks for making this a very special place.